Get better exosome-mediated cargo delivery with the EV-Entry System. This easy-to-use two-component reagent system not only increases the rate at which recipient cells take up exosomes and other extracellular vesicles (EVs), it also increases offloading of the transported cargo into the cytoplasm of the recipient cells, whether that cargo is RNA or protein. The EV-Entry System increases the efficiency of exosome-mediated delivery of proteins to target cells. 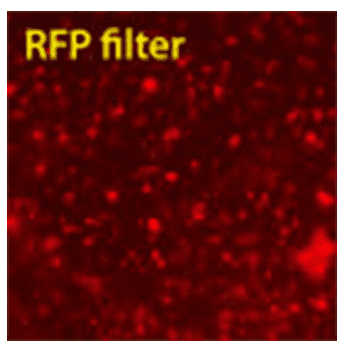 In Figure 1, Exo-Green is used to label exosomal proteins, and then EV-Entry enhanced transfer of Exo-Green-labeled exosomal proteins to recipient cells is monitored using fluorescence microscopy. In Figure 2, enhanced transfer of a specific exosomal protein—XPack-Luciferase (Cat.# XPAK732PA-1)—is shown. In both cases, the EV-Entry System increases the amount of cargo delivered. Figure 1. The EV-Entry System enhances delivery of Exo-Green-labeled exosomal proteins to recipient cells. Exosomes were labeled with Exo-Green and added to HEK293 cells with or without the EV-Entry reagent, and cells imaged after 18 hours. Cells that received exosomes with the EV-Entry reagent showed remarkably enhanced uptake of exosomes and release of exosomal cargo into the cytoplasm as demonstrated by the staining pattern of exosomal proteins in the recipient cells using a very brief exposure time. Figure 2. The EV-Entry System enhances delivery of XPack-Luciferase to recipient cells. HEK 293 cells were transfected with XPack-Luciferase, exosomes were harvested, and then these XPack-Luciferase-containing exosomes were added to naive HEK 293 cells with or without the EV-Entry reagent. After 18 hours, target cells were washed multiple times with PBS, lysed and luciferase activity measured. Cells that received XPack-Luciferase exosomes treated with the EV-Entry reagent demonstrated over 11-fold greater luciferase activity compared to untreated exosomes, demonstrating that EV-Entry enhances cargo delivery. The EV-Entry System also increases the efficiency of RNA cargo delivery. In Figure 3, XMIR Texas Red-labeled Positive Control RNA Oligos (Cat.# XMIR-POS) are used to label exosomes and then EV-Entry enhanced transfer of the XMIR Texas Red-labeled RNA Oligo to recipient cells is monitored using fluorescence microscopy. As with the delivery of protein cargo, the EV-Entry System improves the efficiency of exosome-mediated delivery of RNAs. Figure 3. The EV-Entry System enhances delivery of a Texas Red-labeled exosomal RNA to recipient cells. HEK293 EV Shuttles (Cat.# EVS105A-1, 100 µg) were Exo-Fected with Texas Red-labeled control siRNA (50 pmol) and incubated naïve HEK293 cell with or without the EV-Entry reagent. Recipient cells were imaged 18 hours post incubation. The EV-Entry reagent greatly increased the exosome-mediated siRNA delivery to recipient cells.